I’ve seen this photo so many times on facebook now, that I just had to share my experience with coconut oil. Indeed, it’s amazing and is a solution for so many things! 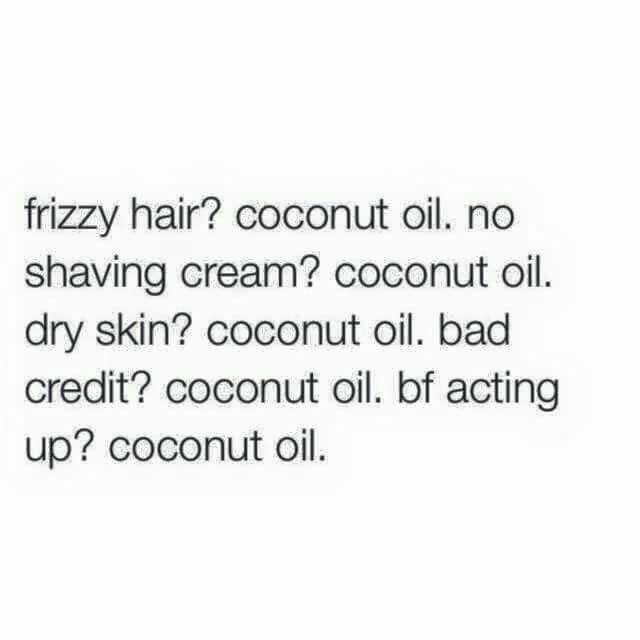 However, coconut oil is not my whole life or someting like that, I mean some people use it for everything. There are a lot of health benefits and other benefits of coconut oil to be found all over the internet, but I never really tried this. (maybe I should?) In this post I will tell you my tips and experience with coconut oil. It also can be used as a makeup remover for your whole face, or only the eyes. I like it remove my eyemakeup with coconut oil. The grease works very good for removing mascara and eyeliner. Coconut oil is perfect to moisturize your dry legs, knees, elbows, lips and even cuticles. It makes your skin so soft, and it smells lightly like coconut but it’s mostly odorless. We used to use coconut oil to bake our meat and vegetables. It works really well! The only disadvantage is that coconut oil is hard when it’s cold, so you always have to scoop it out. I personally find it easier when cooking oil is liquid, so I prefer olive oil more to cook with. What are you experiences with coconut oil? Thank you so much for visiting, have a lovely day!